For the fourth successive year Michael Schumacher and Ferrari dominated the season, winning both constructors' and drivers' championships, although not by the massive margins seen the previous year. Schumacher, who had secured the 2002 title by July and was never out of the top two all year, was made to work harder for his crown as eight different drivers won races. While he led the drivers' standings from early on, thanks to four wins in five races, there were three drivers separated by two points with three races remaining. Schumacher then saw off his rivals with back-to-back wins in Italy and the USA. Kimi Räikkönen, in a McLaren Mercedes, lost the championship to Schumacher by two points, although he won only one race to Schumacher's six. Ferrari's defence of the constructors' title was equally tough as Williams and McLaren consistently snapped at its heels. Whereas in 2002 it scored more points than all the other teams combined, this time it edged home by 14. For the marketing men and fans in general, the genuine competition on show after a few years of processional racing was welcomed and buoyant crowd numbers indicated the product remained popular. 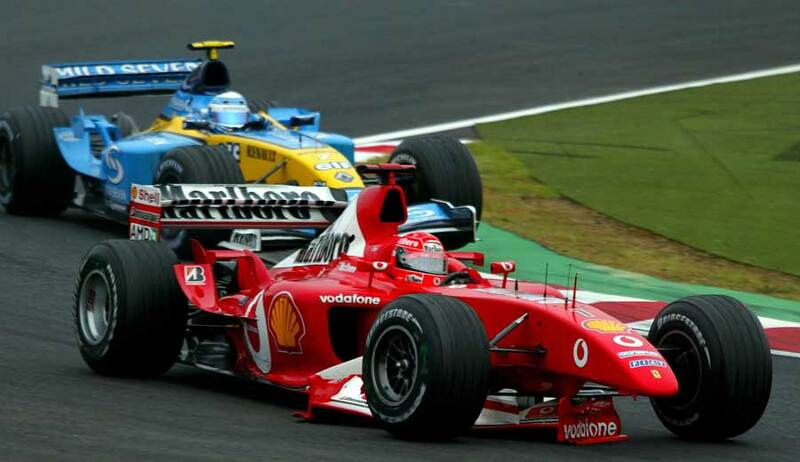 The Brazilian Grand Prix was memorable for appalling conditions, endless tyre changes and an eventual win for Jordan's Giancarlo Fisichella. Schumacher recorded an emotional triumph at San Marino hours after his mother's death, while Fernando Alonso became the youngest F1 winner with his victory in Hungary. The FIA had already made changes to try to increase the appeal of the sport, allowing one-lap qualifying to allow smaller teams more exposure and also introducing optional Friday testing to help reduce costs. The choice of wet-weather tyres was reduced to one and the scoring system was also tweaked to try to make the championships closer. In that regard, it was a success. One team did go under. Arrows, who failed to finish 2002 after being dogged by financial problems, was refused admission in 2003 and subsequently folded after a quarter of a century in F1.